Roach Motel® (Roach Trap) contains no pesticides and no pesticide fumes or odors. It is safe to use in kitchens, bathrooms and basements. Roach Motel (Roach Trap) is extremely effective in eliminating all kinds of roaches and other crawling bugs including crickets, scorpions, spiders, Palmetto bugs and waterbugs. 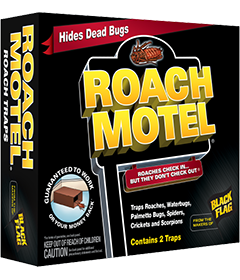 Roach Motel (Roach Trap) contains a special lure that attracts roaches into the trap. Once inside, they become stuck in a powerful glue and die. 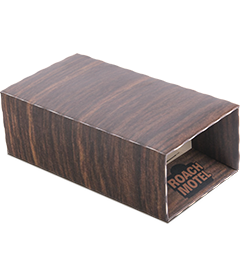 Roach Motel (Roach Trap) is clean and easy to use. There is no need to clean out cabinets or pick up dead bugs throughout the house. Just throw this product away when full. Use Black Flag® Ant & Roach Killer to eliminate heavy bug infestations. Continue trapping to maintain control. Remove traps from wrapper. Place in corners, along walls, under sinks, in cabinets or behind appliances where roaches and other crawling bugs live and hide. Allow three to four days to work. If trap is empty, move to another location. Since traps will contain insects, children should not handle them. When trap is full, flip trap over. Discard in trash when both sides are full. Avoid contact with the adhesive inside this product because it is very sticky. If any adhesive gets on your skin, rub gently with vegetable oil, then wash with soap and water. Repeat if necessary. But remember, the Roach Motel is pesticide-free!